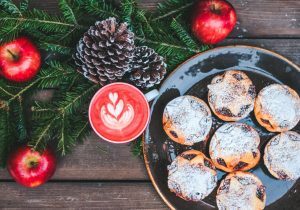 Get in the Christmas spirit by creating these delicious melt-in-the mouth mince pies. A festive recipe for all the family to enjoy. Using a round cutter (about 10cm), cut out 16 bases and place them into muffin trays. Put 1 1/2 tbsp mincemeat mixture into each. Brush the edge of each pie with a little beaten egg.